You should absolutely be 100 percent grateful for everything you have in your life, but that doesn't mean you can't desire something completely different, or take steps to make changes in your life. I respectfully disagree with the notion that doing what's best for ourselves is narcissistic or immature. In all honestly, this actually gets me pretty angry and fired up. It's this exact type of belief and accusation that leads people to feeling perpetually dissatisfied, fearful, unhappy, undeserving, and unfulfilled. It also keeps people stuck, effectively reducing their contribution to this world. Making changes that honor your needs and desires is actually of greater service to everything and everyone around you. By leaving a relationship that doesn't serve or fulfill you, you're doing a service to both yourself and the other person. How is staying in a relationship that you're not happy in of service to both parties? I'm not saying you don't try if you're married, have kids, in a committed relationship or you both want to make it work... but by ending the relationship, both people have an opportunity to find a new relationship that truly fulfills them. I say this from personal experience. I could never have given my ex what he needed and deserved as a person because my heart wasn't in it. How is staying in a profession you only got into to please your parents or to simply make money of service to anyone? When you dislike what you do, you don't show up fully. That doesn't serve the company, the clients or yourself. We all have a right to do the work we were put here to do, and many people get off course for various reasons. Leaving the job allows you to find the work you're meant to be doing, the work that lights you up, so that you can be of greater service in this world. Leaving the job also creates the space and opportunity for the right employee to come into the picture. As a small business owner, I'd much prefer an employee leave, no matter how valuable they are or what they're in the middle of working on, if their heart is not 100 percent in it. How is staying exactly where you are, simply because others think you "have it all," of service to anyone or anything? If Steve Jobs had never dropped out of college and followed his desire to drop in on creative courses such as calligraphy, we wouldn't have Apple computers or iPhones. If Bill Gates hadn't dropped out of college, we wouldn't have the personal computers that we all need and use. If Mother Teresa hadn't heeded the calling within her to live among the poor, and instead chose to stay exactly where she was, we wouldn't have had such an amazing soul doing amazing work in the world. If Mahatma Gandhi hadn't followed his passion for social activism and civil rights, and instead continued trying to build a law practice, not only would we not have had such an incredible leader in this world, a pastor named Martin Luther King Jr. would never have been inspired to stand up for civil rights here in the U.S. using the principles of non-violence. One of the hardest concepts for us to grasp is that making choices that honor ourselves and our happiness is actually a tremendous service to those around us. If someone leaves us because they're honoring themselves, we think they're just selfish and narcissistic... but why would we want to be with someone that doesn't fully and completely want to be with us? If a good, well paid lawyer leaves their job, they're crazy or ungrateful. After all, so many people are without work and they have a job and financial security. But why would we want a lawyer on our case (or any case) that doesn't fully and completely want to serve and support us? Your choosing to leave a relationship or job, to make changes in your life that serve you, is no different than those great individuals we honor in our society and world. Heeding the callings within your soul, honoring your intuitive hits, and making the necessary changes you need is honoring yourself. It's also honoring your purpose in this world, whatever that may be. It's being of service to those around you. Far too many people play it small, stay in relationships that aren't serving either party, or never become the person they're meant to be, simply because of the false notion that making changes is selfish, makes them ungrateful, or means they're immature or narcissistic. I will not stand by and allow those beliefs to hold people back from living the lives they're meant to live. From having the love and fulfillment they deserve (and the partner they may be leaving deserves). From being of service and contributing to this world in they way that they're meant to. Far too many of my coaching clients and Foundations members tell me that they aren't living true to themselves, their purpose or they're needs because they "should be grateful" for what they have right now. As I said in the original post, you should absolutely be 100 percent grateful for everything you have in your life, but that doesn't mean you can't desire something completely different, or take steps to make changes in your life. Being grateful for what you have and where you are now creates an energy and environment for you to make changes with ease. But it doesn't mean you can't be unhappy, want something or someone totally different, or that you can't take the necessary steps to make changes in your life. Staying where you are is not of service to anyone or anything. This world doesn't need more people who are doing what they think they should be doing and staying where they are out of a false sense of obligation. What this world needs is more people who are stepping into their truth, showing up fully in their relationships and work in the world, and people who are joyful, passionate and on purpose. Where are you staying stuck or not honoring yourself due to a sense of obligation, or a fear of shaking things up? 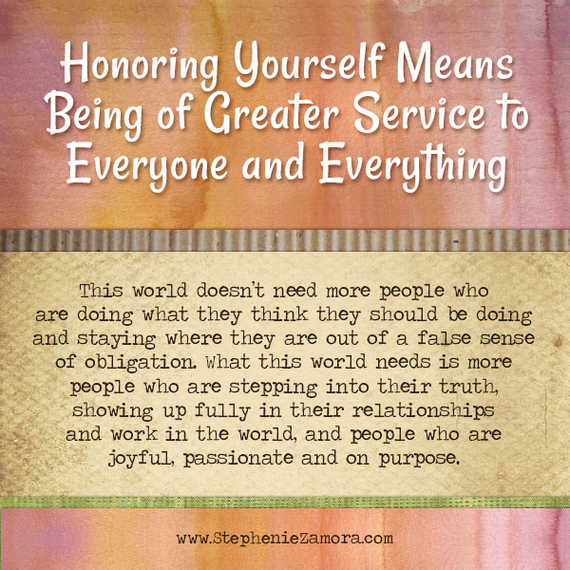 Where are you not honoring yourself and others, whether that's a person, employer, client or other? Where are you not making changes because you believe it would make you ungrateful or selfish? 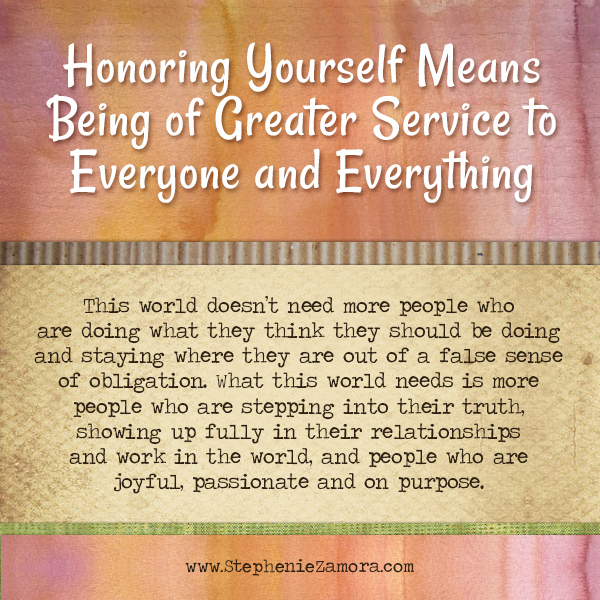 How can you start honoring your needs, make a choice that's of greater service to you and those involved, while still expressing gratitude for what you do have in your life? Stephenie Zamora is the founder of www.stepheniezamora.com;, a full-service, life-purpose development, design and branding boutique. Here she merges the worlds of personal development and branding to help young women build passion-based businesses. Click here to download her free guide, "The Unexpected Trick to Transforming Your Life With ONE Single Question."